information you need to understand and to be found ready for the coming Rapture 'event horizon'. We are told to WATCH. 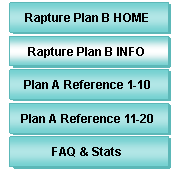 Rapture Plan B app provides resources to help you understand this coming End Times event and to not be surprised by it. Be always on the watch, and pray that you may be able to escape all that is about to happen, and that you may be able to stand before the Son of Man. We are told to BE FOUND READY. 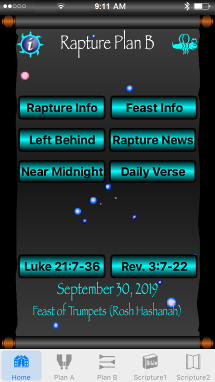 Daily Rapture related news stories and a daily Bible verse with an encouraging commentary are linked to on the app Home page. Do you not know that in a race all the runners run, but only one receives the prize? So run that you may obtain it. Every athlete exercises self-control in all things. They do it to receive a perishable wreath, but we an imperishable. 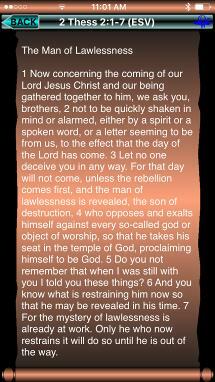 We are told to NOT BE DECEIVED. Two algorithmic functions in the app can be run to help you to understand the times you are living in. Don’t let anyone deceive you in any way, for that day will not come until the rebellion occurs and the man of lawlessness is revealed, the man doomed to destruction. So God will send great deception upon them, and they will believe all these lies. 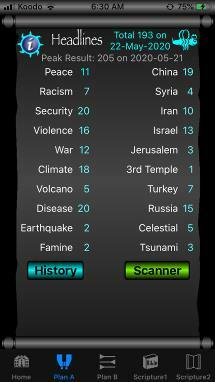 An internet scan can be run by this app to search for prophetically important topics found in the current news headlines. The latest counts for each of the 20 topics are displayed on the Plan A Headlines page. Your latest total and peak historical total are also shown on the Plan A page. Previous totals are stored in a History file. This is to help you get a sense of what is 'normal', and to make you aware of any trending increase over time. Running the Headline Scanner typically takes less than a minute, depending on your internet connection. This is much faster and efficient than 'watching' any other way. Run it daily to get a clear indication of upward trends. An internet 'web check' function can be run to help confirm that it may have happened. Eighteen world news websites are checked for key phrases. Two Christian websites are checked for inactivity. An algorithm analyzes the web check results on a scale of 0 to 7. This indicator level is normally expected to be at or near zero before the Rapture. 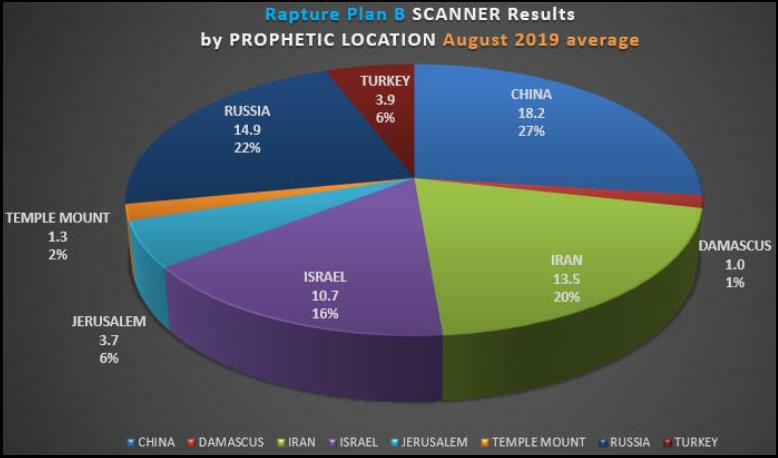 A 'trigger' level of 7 is attained when at least 16 separate and consistent worldwide Rapture indicators are found. If the Rapture event horizon has been crossed, this app can provide helpful information to those who are left behind. Seven years of upcoming dates are listed for the next two 'Jewish' Feasts that are yet to be fulfilled. 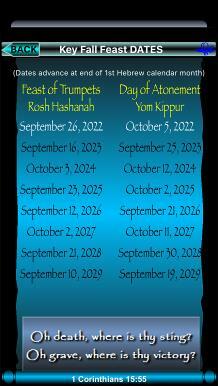 These Fall Feasts are the 'Feast of Trumpets' (Rosh Hashanah) and the 'Day of Atonement' (Yom Kippur). It is very likely that Rosh Hashanah will be fulfilled in the Resurrection followed by the Rapture. The dates automatically advance at the end of the first Hebrew calendar month of Tishri. If the Plan B web check triggers (at Level 7) then the display dates will lock and will no longer automatically advance. The final Feast (Tabernacles/Sukkot) would be fulfilled at the end of the 7 year Tribulation. 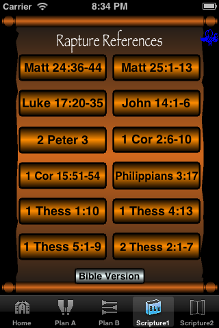 Two Scripture Reference pages provide links for key Bible verses. Page 1 focuses on Rapture prophecies. Page 2 focuses on Tribulation and 2nd Coming prophecies. You may choose to display Bible verses offline in the English Standard Version (ESV). Other Bible versions and languages are available from a selection of online sources.